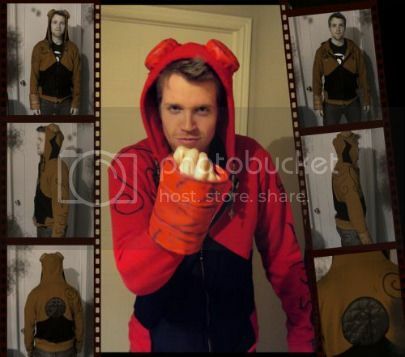 Here’s deviantART user Andrew H‘s Hellboy hoodie, that he made for his brother, Anthony. I can certainly appreciate the artistry and the geeky deliciousness of this thing, but can only assume that Andrew is intent on protecting his brother’s virginity. Way to make a stand for virtue and chastity and other boring stuff, Andrew! Make sure Anthony wears that hoodie to school every single day. Via Walyou, whose scorn for english grammar surpasses my scorn for chastity.